rocky's bru: After Supermax, will Rafidah stay on at AAX? If the above is so, Rafidah Aziz should have resigned as Supermax chairman earlier. Like in December 2017, when Stanley Thai was convicted for insider trading and sentenced to 5 years' jail. I would imagine that a "strong proponent of integrity and honesty" would have freaked out over something like that. Rafidah stayed on, didn't utter a word. As "a strong proponent of integrity and honesty", someone said to me, maybe Rafidah should not even have accepted the job in the first place. 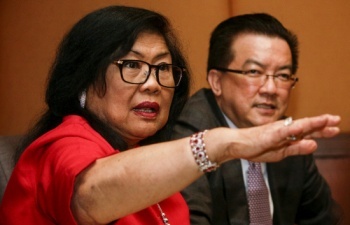 Stanley Thai was charged for insider trading in 2014 [Tycoon claims trial to insider trading charge]; Rafidah came on board at Supermax the following year, in 2015. In 2015, Stanley Thai was still a leading anti-BN, anti-Najib Razak corporate leader. But against his own chairman Rafidah's increasingly harsh criticisms of Prime Minister Najib, Stanley Thai has now gone public to admit that he had been "influenced by the Opposition's propaganda in the previous general election". If Rafidah's decision to quit Supermax is indeed because of Stanley Thai's support for Najib, the business community will no doubt be watching her move at AirAsiaX closely. Tony Fernandes and gang brought her in as chairman of AAX in 2011 because of her vast experience as a minister and negotiator, not because of her anti-Najib antics. Kasi tahu dulu. Blh beli shares AAX.